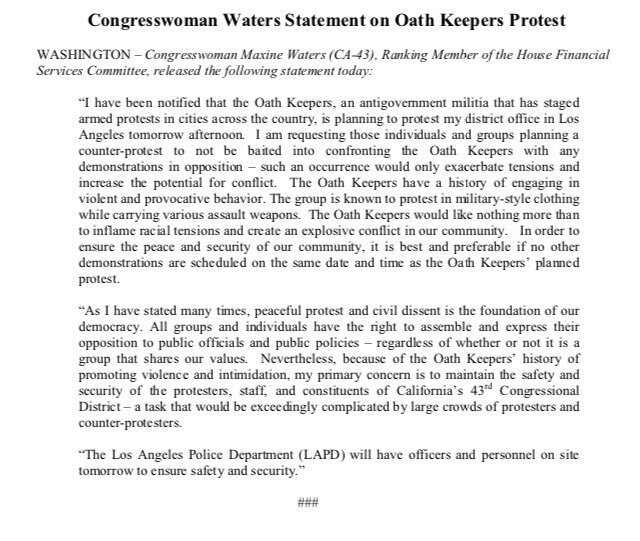 Supporters of Democratic Rep. Maxine Waters gather outside her South L.A. office Thursday after members of the Oath Keepers said they were going to protest there. Police said the far-right anti-government group decided not to show up in order to ensure peace. A group of far-right protesters who planned to demonstrate outside Rep. Maxine Waters’ district office in South Los Angeles on Thursday afternoon failed to show up, but dozens of counterprotesters did. The Oath Keepers, a far-right anti-government group that purports to have many veterans as members, had said they would protest outside the Los Angeles Democrat’s office on Thursday afternoon. Waters, who is one of President Trump’s most outspoken critics, angered the group and others by calling on the public to “push back” on administration officials they spot in public. But at 1 p.m., police at the protest site said authorities had been in contact with the group, and it had decided not to come in order to ensure peace. For her part, Waters urged counterprotesters to stay away. She noted that the organization, which at various points over the last decade has formed militias across the country, also has a history of attempting to provoke violence. “The Oath Keepers would like nothing more than to inflame racial tensions and create an explosive conflict in our community,” Waters said in a statement. That didn’t stop around 50 counterprotesters from arriving outside her office by 12:40 p.m., some from the United Union of Roofers, Waterproofers and Allied Workers Local No. 36. A number of protesters remained near the intersection of 102nd Street and Broadway long after police announced the Oath Keepers were no-shows. For much of this time, the mood remained festive, although it was punctuated with moments of tension. Pastor Cue Jnmarie, from the Row Church, said he wouldn’t have decided to burn a flag, but people should be able to choose how they express themselves. “What they were saying is America has never been great to them,” Jnmarie said. He was among about 100 people spread out on along sides of the street about 2:30 p.m.. At times he broke up scuffles between counterprotesters and those suspected of supporting Trump. In the age of Trump, Waters became a bit of a bugbear for the right after she called on citizens to get out and protest members of the Trump administration wherever they may be. “If you see anybody from that [Trump] Cabinet in a restaurant, in a department store, at a gasoline station, you get out and you create a crowd and you push back on them! And you tell them that they are not welcome, anymore, anywhere,” Waters said. Her opponents continue to attempt to use these comments to say that she is calling for violence against Trump administration members. At 79, she’s in her 14th term, but has never been more famous among young liberals pining for a bulwark against Trump. Last year, she refused to attend Trump’s inauguration and regularly refers to his staff as the “Kremlin Klan” in tweets and statements. About a dozen officers were at the scene Thursday. By 3:15 p.m., only one squad car remained. Waters’ office appeared empty, but that didn’t stop locals from expressing their support for “Auntie Maxine,” as one sign read. “Maxine is a good woman for the whole community,” said Ed Rice, 65, a businessman who said he owns five Popeyes franchises. Rice said Trump never campaigned in communities with a high percentage of African Americans, such as the one where Waters’ office is located. 4:20 p.m.: This article was updated with information about the protest, and interviews with Pastor Cue Jnmarie and businessman Ed Rice. 2 p.m.: This article was updated with news that the Oath Keepers were not coming to the protest, and with remarks from union organizer Cliff Smith.